Morristown Parks and Rec Director Craig Price speaks to the Rose Service Guild. 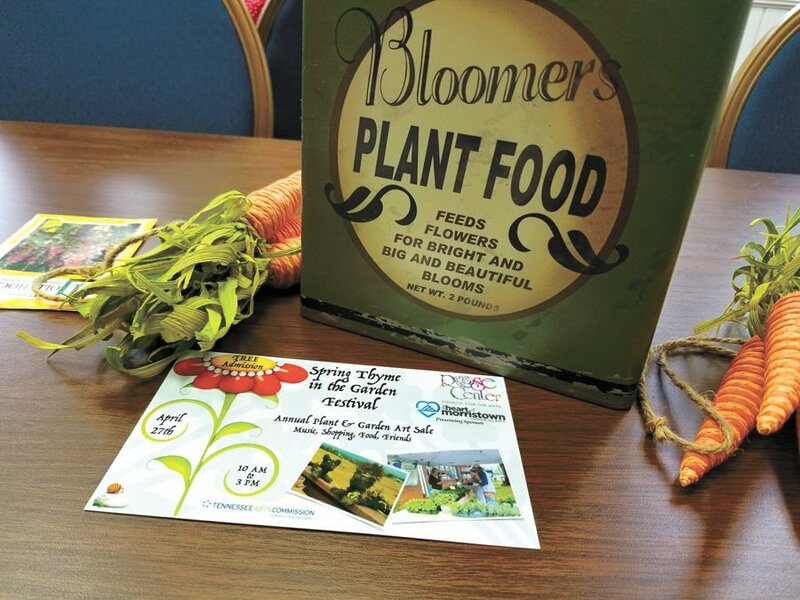 A display previewing the upcoming Spring Thyme in the Garden Festival at the Rose Service Guild meeting. The goal for Morristown’s newest park, Heritage, is to make it a viable, open park in the passive sense, Rose Service Guild members learned. 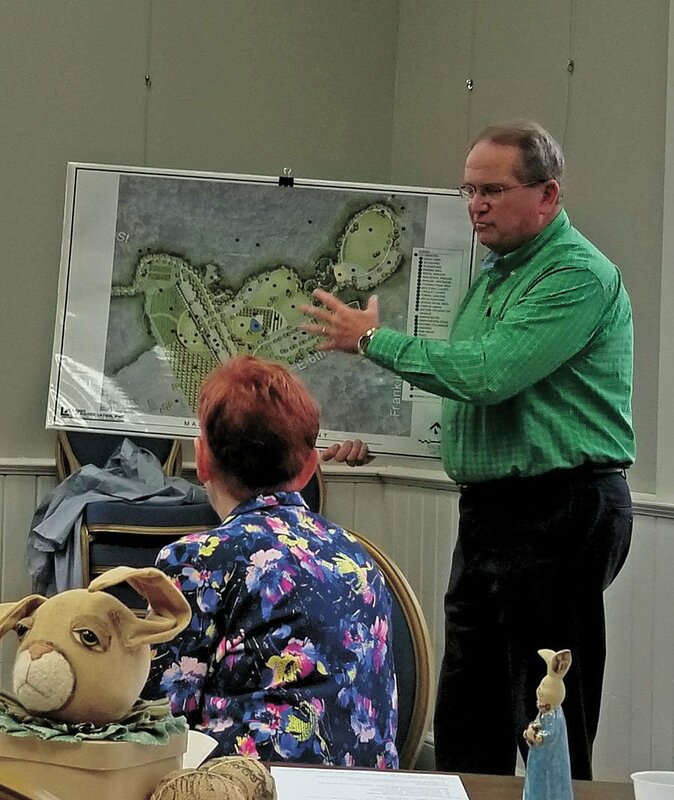 The Guild hosted Morristown Parks and Recreation Director Craig Price at its regular meeting to discuss the community asset that has a tentative opening of late summer. The word passive, with regard to recreation, denotes a lack of organized sports. The expanse of green areas, though, may challenge that passive theme. “I’m going to be challenged with keeping it as ‘no sports;’ that means no soccer balls, etc,” Price said. The park will encompass 52 acres in total when completed, with three divisions. The Great Lawn, located at the highest elevation of the property, was the former Morristown College baseball field. A walking trail and a sidewalk will be constructed from the parking lot to the Lawn area. In the future, a splash pad and playground are planned. An irrigation system has been installed in the area that includes a large swath of grass. The other two divisions of the park are the educational area and the replica of the Great Colonnade that once connected two of the college buildings. A courtyard near the Colonnade will be a great place for movies at the park and special events like weddings – “We’d have to set up tents, etc,” Price said. The Great Lawn is expected to host other types of special events, like music concerts and community gatherings. “We’re looking at an $8- or $10 million complex when all this is done,” Price said. The educational area will include a reflective pool and an amphitheater, along with signage indicating the history of the site. Among the challenges for the park will be adequate parking; the plans include former college parking lots located near the gymnasium, the administrative building and science buildings. “Eventually we want a new entrance to come off of North Cumberland,” Price said. Trees have been planted, 150 in total, representing 10 species. The park will be handicap accessible. The first of three restroom facilities is being constructed. The former tennis courts will eventually be refurbished as bocce ball courts, according to plans. Some of the walking trails are roughed in, some are accessible, Price said, but the park as a whole is under construction. Multi-use trails will be developed in other areas of the city; four miles of trails to be built at Frank Lorino Park. As athletic teams have stabilized, or even fallen in numbers, individual sports like running, walking, bicycling, skateboarding and disc golf have taken off in parks across the county. “That’s the thing about disc golf, you can play it competitively; or, if you just want to go out to a course and throw, you can. A large numbers of families play on local courses; it can take up three or four hours, easily. Disc golf is economical, players get their exercise — there are no carts to ride in — the goal is to throw a disc from Point A to Point B,” Price said. There were 163 participants in a recent city-wide disc golf tournament, 45 of whom were from out of state, Price said. The winner was from Miamiville, Ohio. “You don’t realize how many people will drive three or four hours to show up at one of the four disc golf courses and play on a Friday, Saturday and Sunday. And they spend money here, too. Local people enjoy it too,” Price said. At one point, a disc golf course was discussed for Heritage Park, but it was decided the sport wasn’t the right fit for the historic site. Price gave a few autobiographical notes to the gathering, including the fact he had wanted to be a teacher until he met classmate Mac Brown during a psychology lecture his junior year at UT. “He had a little ugly brown book titled, ‘Recreation Administration,’’ Price said. “I grew up at First Baptist Church in Rogersville; my mentor was Darryl Newman. We had about 80 kids sing in the choir every Sunday night; we had Bible studies; we went to Camp Carson, Ridgecrest; I grew up sheltered in greatness. I knew I loved people, I knew I loved sports. I was in charge of the church bicycle club, the basketball program, softball. We had a great time growing up. We used to ride bicycles over to Kingsport and Pressman’s Home; we’ve ridden them to Morristown. I wouldn’t do that today for nothin.’ Those were great times,” he said. Dr. Martha Peters, dean of the department of education, confirmed that Price’s first two years at UT, every single class, would count toward a degree in recreation administration. After graduation, he started and then served for 16 years as director of the Rogersville Parks and Recreation department. He reminisced about the blizzard of ’93; March 13 of that year was his first day on the job as director of Morristown Parks and Recreation — he arrived four hours late. He told the group that Mike Cupp is the newly-hired city arborist. Walters Park, a former baseball field, has been removed as an active park in the department’s usage plan. There has never been a parking lot on the site, which limited access. The property will always remain a designated park, as per the Walters Foundation. Price said he would like to see it eventually developed as a nursery, to foster tree seedlings for plantings at city parks and landmarks. Members of the Morristown Tree Board were present at the meeting, including Wanda Neal. A dogwood was recently planted in her honor in front of Prater Hall at Rose Center, as part of the city’s Legacy Tree program.